Dar is an irregular verb. In fact, it is very irregular, and its conjugation is quite challenging. It is also a very important verb to learn because we use it in no many idiomatic expressions. In this lesson you will learn 3 common and useful Brazilian Portuguese expressions with the verb Dar. To practice the conjugation of Dar, get my flashcard app for Android. Set 3 of the flashcards helps you practice the present and past tenses of two important irregular verbs: Dar and Fazer. Get the app here. Speaking of Fazer, do you have my worksheet with 7 idiomatic expressions with the verb Fazer? When you sign up to our newsletter, you receive three learning resources, including the worksheet on expressions with Fazer. Good deal, right? Subscribe to my newsletter here. Sílvia: Tenho uma reunião na sexta com um cliente muito exigente. Paulo: Você precisa se preparar bem. Improvisar nunca dá certo. Sílvia: I have a meeting on Friday with a very demanding client. Paulo: You need to prepare well. Improvising never works out. Paulo: E aí, como foi a reunião ontem? Deu tudo certo? Sílvia: Deu certo, sim. Fechei o negócio. Paulo: So, how was the meeting yesterday? Did everything work out? Sílvia: Yes, it worked out fine. I closed the deal. Paulo: Amanhã começo no novo trabalho. Estou meio nervoso. Sílvia: Vai dar tudo certo. Paulo: Tomorrow I start at the new job. I’m kind of nervous. Sílvia: Everything will work out fine. Dar pra trás means to chicken out; to change one’s mind and quit on what they were going to do. Maria: Não vamos mais viajar. João deu pra trás na última hora. Carla: Que pena. Sinto muito. Maria: É sempre assim. A gente combina tudo, e no fim João dá pra trás. Carla: When do you guys travel? Maria: We are not going to travel anymore. João changed his mind and quit at the last minute. Carla: What a shame. I’m sorry. Maria: It’s always the same. We plan everything, and at the end João chickens out. Dar uma mão means to give a hand, to lend a hand. Marta: Essa caixa é muito pesada para eu carregar. Você pode me dar uma mão? Marta: This box is too heavy for me to carry. Can you give me a hand? Luciana: Eu estava sem ideias para escrever este exemplo. Por sorte, Carl me deu uma mãozinha. Luciana: I was out of ideas to write this example. Luckily Carl gave me a hand. Idiomatic expressions are important for good communication. 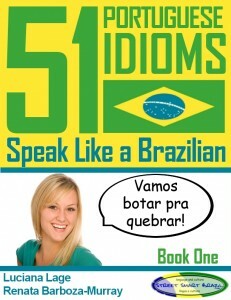 Get my book to learn 51 Brazilian Portuguese expressions and impress your friends! Available on Kindle and paperback. Very useful and impressive blog. Thanks Luciana for your efforts of helping people pick up their Portuguese online for free. Obrigada pela mensagem! We also offer one-on-one Brazilian Portuguese lessons via Skype. We have a team of excellent instructors.